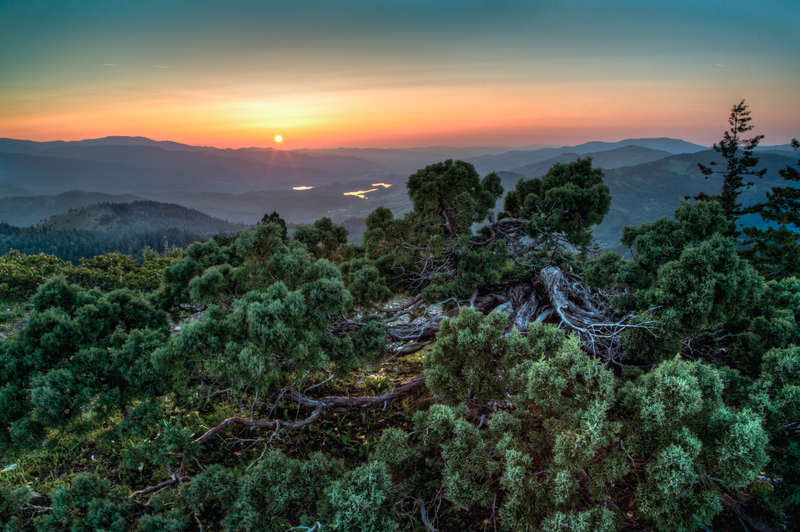 Cascade Siskiyou National Monument (CSNM) is located just 17 miles south and east of Ashland. Originally designated in June of 2000 for its unparalleled biodiversity, the monument has something for everyone — whether you like to hike, fish, horseback ride, hunt or take Sunday afternoon drives on historic Highway 66. At the beginning of this year, the Monument was expanded generating a renewed focus in developing strong programs and partnerships. 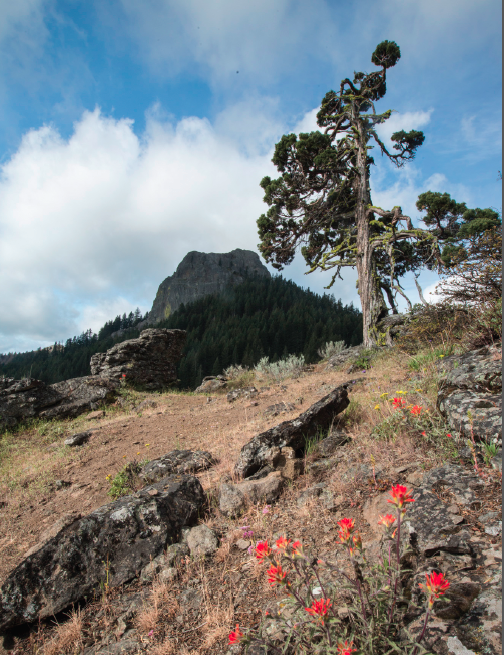 In today’s LocalsGuide feature we are are celebrating the fact that several key organizations and individuals are coming together to make the Cascade Siskiyou National Monument (CSNM) bloom. With leadership from the Bureau of Land Management (BLM) and its partners including Friends of Cascade-Siskiyou National Monument, Southern Oregon University, Siskiyou Mountain Club, Pacific Crest Trail Association and many others, the monument has something for everyone! In todays interview we speak with Christine Beekman Interpretive Specialist of Cascade-Siskiyou National Monument), Diarmuid McGuire of Green Springs Inn & Cabins, and Shannon Browne, Community Partnerships director of Friends of the Cascade-Siskiyou National Monument. Chistine, Diarmuid and Shannon thanks so much for being here today to do this interview with us. Christine: Thank you so much for this opportunity to highlight some new programs and things for people to do in Cascade-Siskiyou National Monument. Shannon: It’s a pleasure to speak with you today. We, the Friends, appreciate the opportunity to share with others about why Cascade-Siskiyou National Monument is a regional treasure. Diarmuid: Like our guests and visitors, we are grateful to Cascade-Siskiyou National Monument staff and the Friends for putting our Monument on the map. To begin with I’d love for you to give us a little history and background to the Siskiyou-Cascade National Monument located right here in our own back yard. Christine: CSNM was designated a national monument 17 years ago. It is the only national monument ever established to protect biological diversity. CSNM represents the convergence of several mountain ranges – the Cascade Range, the Klamath Siskiyou Mountains and the Basin and Range to the east – that sets the stage for a large variety of plants and animals to live and thrive. Pilot Rock, a volcanic plug similar to Devils Tower, is perhaps the monument’s most striking feature. In addition to CSNM’s wide variety of flora and fauna, there are remarkable cultural resources as well. Take a drive along historic Highway 66 and relive the history. Buckhorn Springs, the Green Springs Inn, Tub Springs State Park, Lincoln on the Green Springs, and the Pinehurst School are just a few stops along the historic highway. Tub Springs State Park is located within the boundaries of CSNM. The Tub Springs name comes from the original tubs that were installed in the 1930s to provide spring water for travelers along historic Highway 66. Tub Springs was also one of the stopping points for early travelers along the Applegate Trail. Today, visitors can fill their water bottles and stroll amidst the towering trees and imagine what it was like here 150 years ago. I’d love to get a better idea of the enormous biological diversity that resides in the monument. 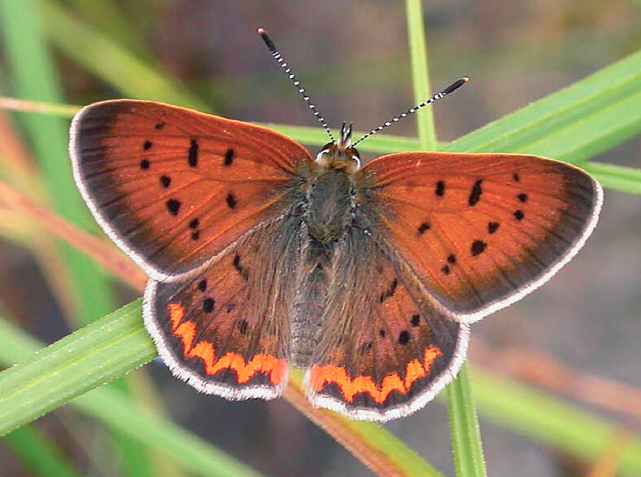 Christine: For example, the state of Oregon there are more than 160 known species of butterflies, more than 130 of which are found in the monument. Not only is that an astounding number, butterflies are an important indicator of biological diversity. Butterfly caterpillars will feed on specific host plants. The presence of a certain kind of butterfly means that its host plant is nearby. So, a large variety of butterflies means there is a large variety of plants, and biodiversity in general. Shannon: It’s very subtle; you might not recognize the biodiversity firsthand. I find every time I go I notice plant species and communities that I didn’t notice before. The monument’s biodiversity is the mosaic of species that create the conifer forests, grasslands and oak savannahs. It becomes more evident when you begin to understand where each individual species comes from, and realize how unique it is that you can find them all co-habituating in this little pocket of Southern Oregon. Diarmuid, what other features make Cascade-Siskiyou National Monument one-of-a-kind? Currently several key organizations are coming together to celebrate the monument. Who are they and what roles do they play? Christine: CSNM’s Friends Group does an enormous amount of work on behalf of the monument. The Friends Group is made up of an all-volunteer board and one paid staff member. They conduct free programming through their Hike and Learn series, and provide funding for BioBlitzs and student research opportunities. The Southern Oregon University’s Masters program in Environmental Education conducts its “Fall in the Field” programming in the monument each fall. Masters students from the program create curriculum-based education programs for K-12 Rogue Valley students. The Greensprings Inn is a business partner that provides the monument’s Information Station building in their parking lot and other programming support. During the winter months, the Southern Oregon Nordic Ski club provides grooming of the nordic trails found in and around the monument. Shannon: There are so many more organizations and individuals that have helped shape CSNM and its programs. There are advocacy organization like the Soda Mountain Wilderness Council and Klamath-Siskiyou Wildlands. The Friends focus mostly on educational programs and supporting advocacy and current research. There are also organizations that maintain trails in the monument such as Siskiyou Mountain Club and the Pacific Crest Trail Association. Diarmuid: Green Springs Inn is honored to provide a building for Cascade-Siskiyou National Monument’s visitor contact station, along with the essential coffee service for the interns. Plus we offer food and lodging to monument visitors. One of these days we hope to contribute land for interpretive and research facilities. Christine, can you please discuss in more detail your role at the BLM as an Interpretive Specialist? Christine: I am the interpretive specialist for Cascade-Siskiyou National Monument. Usually when people hear that I am an interpreter, they think I translate languages. In this role, I actually interpret the monument’s natural and culture resources. I create opportunities – through interpretive media or interpretive programming – for visitors to make intellectual and emotional connections to the resources in the monument. Interpretive media can include social media, brochures and other written materials. Interpretive programming can include walks, talks, and evening campfire programs. There are many new activities coming to life at the monument including an artist in residency program, trail walks, and more. Christine: I’m really excited about our first-ever Artist In Residence program! Three local artists, Mabrie Ormes, Darlene Southworth and Matt Witt, were selected for this summer and each will be conducting free public presentations. 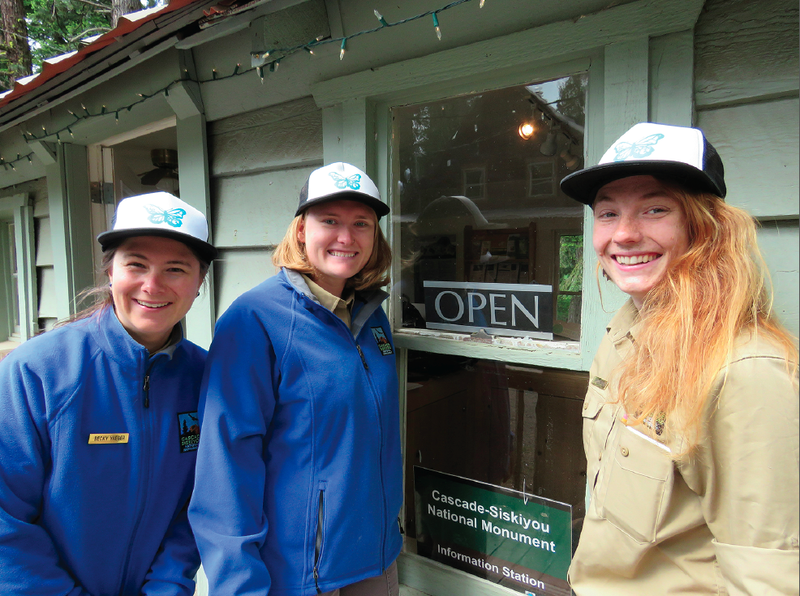 We also have three interpretive park ranger interns staffing the information station for the summer. The interns, Morgyn Ellis, Elizabeth Schyling and Becky Yaeger, are all graduate students in SOU’s Environmental Education program. In addition to providing information to visitors, they will be conducting walks and talks along monument trails and evening programs at the Hyatt Lake campground. CSNM was also selected to host a Teacher on Public Lands (TPL) position this summer! Our TPL is Tara O’Malley. Tara is a 3rd grade teacher at Table Rocks elementary school and is a graduate of Southern Oregon University. During Tara’s summer at the monument, she will be creating a series of lesson plans on the monument that she will be taking back to her school this fall. She’s also receiving graduate credit from the University of Colorado-Denver. There is also a lot of research going on. Please tell us about it. Shannon: The Friends group have an annual grant that supports college students doing research in the monument. Over the years we have had students studying hydrology, geology, stream chemistry, owl habitats, and music composition. Other research is conducted through SOU students and professors, as well as ongoing monitoring done by the BLM. Please tell us about the annual BioBlitz? Shannon: A BioBlitz is a way to engage citizens and the general public in collecting scientific information. The Friends have held a BioBlitz over the last three years focusing on a different element of biodiversity found in the monument from butterflies to fungi. This March we held a herpetology BioBlitz. 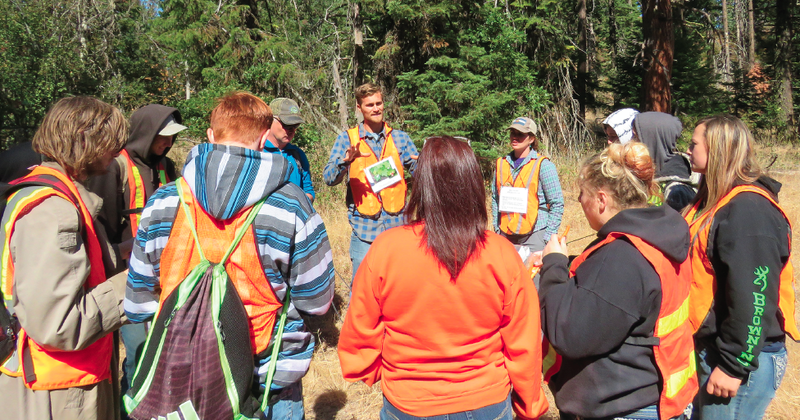 SOU biology students led groups of volunteers to survey and document findings of amphibian and reptile life. Next year we hope to have a BioBlitz to count the many different species of birds in the monument. All readers are invited! Christine: We are always looking for more CSNM volunteers. If you like hiking and talking with visitors, we can use you! Volunteers are the public face of the monument, and provide the much needed boots on the ground presence. We provide you with training, a volunteer uniform, a small mileage reimbursement and coffee and donuts! Shannon: Our summer Hike & Learn schedule is underway, we have a great line-up visit our website cascade-siskiyou.org to find out about our upcoming events. The monument is coming to life! Would you each like to share any last thoughts or comments with our readers? Christine: Please come take advantage of the cooler temperatures at the monument and come visit us! Shannon: I am most excited about the opportunities the expansion brings. The monument now encompasses a broader range of elevations, allowing a bigger footprint for species to adapt with climate change. With more land under protection our regions biodiversity can be safeguarded for future generations. Visit cascadesiskiyou.org for ways to get involved and ensure the monument remains as is. Diarmuid – Up to now, the monument has been an idea. Now it is becoming a real thing that people can touch, feel, and taste. Science is helping us understand the critical importance of this special place. Thanks to Governor Kate Brown, U.S. Senators Jeff Merkly and Ron Wyden along with local elected officials, Dave Willis and the Soda Mountain Society, CSNM staff, Friends of the Cascade-Siskiyou National Monument and many others, we have created an opportunity for people to share and enjoy our precious resource for generations to come. http://ashland.oregon.localsguide.com/wp-content/uploads/2017/06/Screen-Shot-2017-06-28-at-9.31.27-PM.png 653 982 Diarmuid McGuire http://ashland.oregon.localsguide.com/wp-content/uploads/2018/05/logo-1-300x76.png Diarmuid McGuire2017-06-28 21:37:452018-06-11 21:17:15Welcome to your national monument!